China scholarship council CSC is inviting applications for MOFCOM Scholarship by Ministry of Commerce of the People’s Republic of China for an international student from around the world. The MOFCOM Scholarship is to further strengthen the communication and cooperation between China and other countries as well as to develop talents for developing countries. Every year MOFCOM Scholarship mainly sponsors the young and the middle-aged talents from recipient countries to pursue their postgraduate degree education in China and entrusts China Scholarship Council to administer the Scholarship. MOFCOM Scholarship supports the Master’s program for 2-3 years and the PhD program for 3-4 years from international students who want to study in China. The Chinese Scholarship Council every year offer Chinese Government Scholarship and MOFCOM Scholarship for Pakistani students and the students from around the world. Be a citizen of a developing country other than the People’s Republic of China. Be a master’s degree holder when applying for doctoral program. Be under the age of 45 when applying. 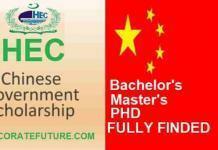 To apply for MOFCOM Scholarship the application and documents should be written in Chinese or English. Submit all the application materials listed above in both hard copy and scanned copy to the Economic and Commercial Counsellor’s Office of Chinese Embassy. Hard copy must include both the original copy and the photocopy, as indicated above.